Jeevaniyam Ayurveda Hospital & Research Centre positioned in the heart of the city at Thammanam in Kochi is at a driving distance of less than 5km from the nearest Metro, Bus and Railway Stations. The nearest airport Cochin International Airport is less than an hour’s drive at a distance of 27km. Nestled amongst the trees the hospital is closeted away from the noise and rush of the city. Managed by a team of professional care givers headed by the chief consultant Dr. Reshmi Pramod the centre houses the Specialty Clinics, Panchakarma Treatment Centre, Centre for Autism and Learning Disorder Management, Jeevaniyam School of Ayurveda and Vocational Training, Jeevaniyam Ayurveda Clinical Yoga Research Centre and also the Jeevaniyam Ayurveda Charitable Trust Office. Expertise in healthcare, integrated approach, caring prompt service and consistent follow-up are the signature policies of Jeevaniyam Ayurveda through which the institute has raised itself to a level much above its contemporaries. Ayurveda, Panchakarma, Yoga, Psychology, Physiotherapy, Naturopathy, Occupational Therapy, Speech Therapy and Counselling are the disciplines integrated into well-researched, experimented and documented Jeevaniyam Ayurveda formulae to assure the needy clients a healthy, happy quality life and a bright future. Jeevaniyam Ayurveda has an in-patient facility which is a part of Aswini Hospital and Maternity Centre at the serene countryside of the temple suburb Kollam near Koyilandy town of Calicut district. The centre apart from providing the facilities of Ayurveda-Panchakarma, Physiotherapy, Psychology-Counselling and other specialties is the destination for integrated Pre-Conception, Ante-Natal, Pregnancy and Post Natal maternal and child care. Both the facilities are headed by the chief consultant Dr. Reshmi Pramod assisted by a team of Resident Medical Doctors and guided by an expert experienced Advisory Panel. The administration ably managed by the support team led by Mr. Pramod ensures disciplined service delivery at both the centres. 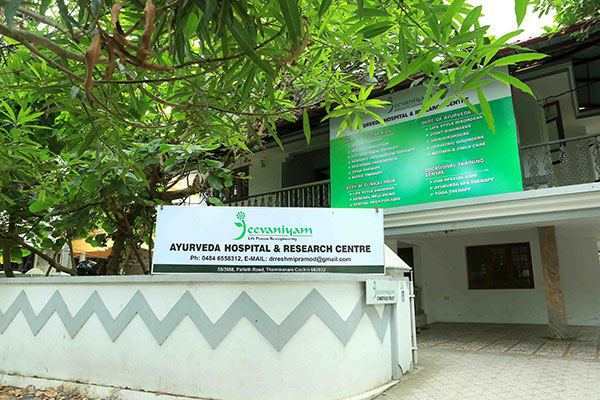 The Jeevaniyam Ayurveda centre boasts of a dedicated home groomed team of health care technical staff who are always ready in executing the treatments, therapies, yoga, diet and other procedures as per the directions of the doctors. Thus completion and perfection with compassion are ensured at Jeevaniyam Ayurveda.